The Sarai Programme, CSDS is organising the Lives of Data Workshop on 5th to 7th January, 2017. The workshop examines the historical and emergent conditions of data-driven knowledge production and circulation in India and South Asia. In the context of the Data Revolution, the workshop links emerging research on the history of statistics, new/old technological forms of inscription, digital infrastructures, and governance after Big Data in India and South Asia. The workshop brings together interdisciplinary researchers and practitioners with backgrounds in history of science, anthropology, media and technology studies, software engineering, data science, economics, and policy-making. It is a space to parse lateral connections and mine new ideas to explore the many lives of data, interrogating stable forms and tracking unexpected pathways. The schedule for the workshop is listed below. 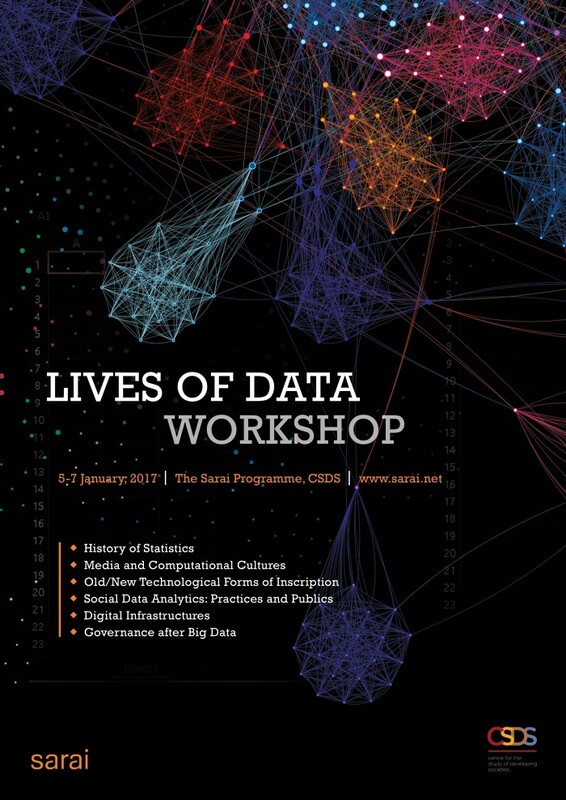 We encourage you to use #LivesOfData to Post or Tweet about the workshop. [05 Jan, 10:30AM] UPDATE: Prof. Phalkey will not be able to join us today due to unforeseen circumstances. We will begin the workshop on 6th January, 9:30am.